The Exeter Rougemont Hotel is located right in the heart of Exeter with close access to Central Station, St David's Station and easily reached from the m5 motorway. 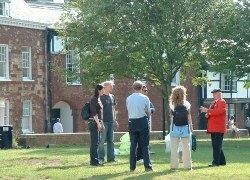 For more information on The Exeter Rougemont Hotel accommodation and other places to stay - view the Hotel's main page. NOTE: This map is intended as a guide only. It is advised that you confirm any markers shown within the map for accuracy. The markers have been placed within approximate positions and therefore should not be used as a navigational aid! If coming from the M5 motorway junction 30 - At the M5 Services roundabout take the first left towards the city centre. Once in the city centre, follow directions to Central Station. There is limited on-site parking for this hotel with additional public car parks located nearby. 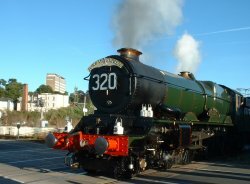 Exeter Central Station in directly opposite the Hotels main entrance and the main Exeter St Davids Station is just over half-a-mile away. Queen Street in on the city centre bus route and regularly links to the Exeter Bus Station and Exeter St Davids railway station. More accommodation services are located nearby. 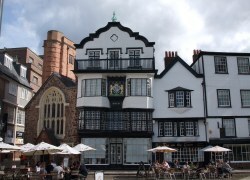 For more details visit our places to stay in Exeter page or alternatively you can check now for the closest hotels to Queen Street .